Ask any aspirant, serving or a retired personal of Indian Defence Services, these three words “Param Veer Chakra” mean more than their life to them. Many who have attained Martyerdom while fighting for the nation with extreme courage have been honoured by this medal, for every other young man who stands at the Line of Action it is the ultimate dream & honour.Have you ever thought about what does the design on that medal mean or who designed it?? Let me tell you about it. Savitri Khanolkar is the designer of India’s highest gallantry award, the Param Vir Chakra. Savitri Khanolkar, born Eve Yvonne Maday de Maros, on July 20, 1913 – 1990 in Neuchâtel, Switzerland, to a Hungarian father André de Maday, professor of sociology at Geneva University and President of the Société de Sociologie de Genève, and Russian mother Marthe Hentzelt, who taught at the Institut Jean-Jacques Rousseau. She later was known as Savitri Bai, the name she was given after she married an Indian, became a Hindu and took Indian nationality. She spent her early childhood in Geneva, where she grew to be a compassionate girl with a love of nature and the outdoors. In 1929, when she was still a teenager, she met Vikram Khanolkar, who born in Marathi family, a young Indian Army officer undergoing training at the Royal Military Academy, Sandhurstin the United Kingdom, who was holidaying in Europe. Although he was many years older than she was, Eve fell in love with him. Her father however, did not agree to let her go away to a faraway country like India but Eve was a determined young woman, and her love was strong. She followed Vikram to India a few years later, and in 1932, she married him at Mumbai. She began her new life adapting to Indian culture as Mrs. Savitribai Khanolkar. Despite coming (or maybe because of coming) from a European background, Savitri Bai identified so closely with Hindu traditions and ideals, that her integration into Indian society was smooth and effortless. She was a vegetarian, learnt to speak fluent Marathi, Sanskrit and Hindi and learnt Indian music, dance and painting. She always claimed that she had been “born in Europe by mistake” as she was Indian soul, & woe unto him who dared to call her a “foreigner”! She was so fascinated with Hindu mythology that she read extensively from Hindu scriptures and had a deep knowledge of India’s ancient history and legends. It was this knowledge that led Major General Hira Lal Atal, the creator of the Param Vir Chakra, to ask for Savitri Bai’s help in designing a medal that would truly symbolize the highest bravery. 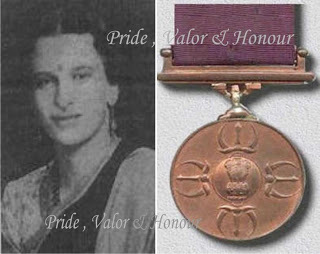 Soon after Indian independence, she was asked by the Adjutant General Major General Hira Lal Atal to design India’s highest award for bravery in combat, the Param Vir Chakra. Major General Hira Lal Atal was given the responsibility for creating and naming independent India’s new military decorations. His reasons for choosing Mrs.Khanolkar were her deep and intimate knowledge of Indian mythology, Sanskrit and Vedas, which he hoped would give the design a truly Indian ethos. She was a painter and an artist, and wife of Captain (later Major General) Vikram Ramji Khanolkar, a serving officer with the Sikh Regiment, at the time of the request. Coincidentally, the first PVC was awarded to her elder daughter’s brother-in-law Major Som Nath Sharma from 4 Kumaon Regiment who wasposthumously awarded for his valour of November 3, 1947 during the 1947-48 Indo-Pak war in Kashmir. Savitribai thought of the sage Dadhichi – a vedic rishi who made the ultimate sacrifice to the Gods. He gave up his body so that the Gods could fashion a deadly weapon – a Vajra, or thunderbolt, from his thigh bone. Savitribai gave Major General Hira Lal Atal, the design of the double Vajra, common in Tibet. Its a myth that the medal also carries images of the fearless warrior king Shivaji’s sword Bhavani but this is a popular perpetuated myth. The Indian General Service Medal (1947) which contained the Bhavani sword was withdrawn later. The medal itself is a small one. It is cast in bronze, and has a radius of 13/8 inch. In the centre, on a raised circle, is the state emblem, surrounded by four replicas of Indra’s Vajra, flanked by the sword of Shivaji. The decoration is suspended from a straight swiveling suspension bar, and is held by a 32 mmpurple ribbon. Savitri Bai had always done a lot a social work which she continued in her later years, working with soldiers and their families and refugees who had been displaced during the Partition. After her husband’s death in 1952, she found refuge in spirituality, and retired to the Ramakrishna Math. She wrote a book on the Saints of Maharashtra that is popular even today. Mrs. Savitri Bai Khanolkar died in 1990, but her memory lives on in the great award that she designed. It is fitting that a remarkable lady who truly lovedIndia and was intensely proud of being an Indian designed an award that is given to soldiers who love their country so much that they are ready to die for it.